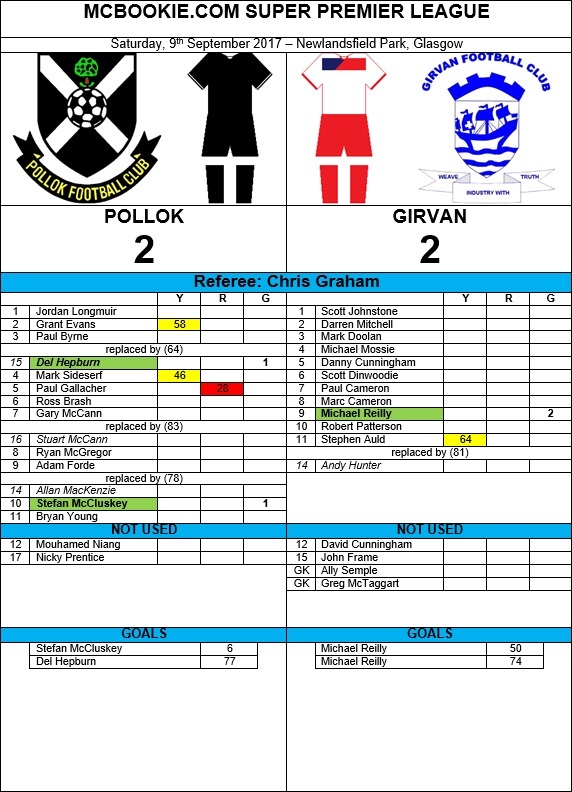 Newly promoted Girvan made their maiden visit to Newlandsfield Park to face Pollok, and left with a share of the points after a 2-2 draw. The Ayrshiremen were up against it in the sixth minute when their hosts took the lead, Paul Byrne’s crossfield pass was controlled by Gary McCann who delivered to the back post where Stef McCluskey was on hand to deftly lift over the advancing Scott Johnstone in the Girvan goal. ‘Lok were dealt a blow in the 28th minute, Paul Gallacher being sent for an early bath after denying an obvious goalscoring opportunity with Robert Patterson bearing down on home goalkeeper Jordan Longmuir. It wouldn’t be until after the interval that the visitors took advantage of their numerical superiority to restore parity. A nice one-two saw Patterson released on the right wing where he delivered a ball across the corridor of uncertainty, Michael Reilly on hand to slide in and net. Reilly made it 2-1 in the 74th minute, the home rearguard failing to clear their lines from a Patterson corner, the Girvan man’s cross was flicked on to the back post where it was finished with aplomb. The homesters responded three minutes later, substitute Del Hepburn picked up the ball midway inside his own half and charged towards the Girvan penalty area, where he confidently placed the ball out of Johnstone’s reach. The match will be refereed by Category 1 Development referee Chris Graham, one of eight officials being assessed for future promotion to the elite group of whistlers in Scotland. As part of that process he is taking charge of SPFL-level games this season and did Montrose vs Stenhousemuir in League 2 as well as Annan Athletic’s 3-1 win over Celtic U20s in the IRN-BRU Cup. Last weekend he had a trip to Edinburgh to ref Lothian Thistle HV’s match with Coldstream in the Scottish Cup while in midweek he was in charge of East Kilbride U20 vs. Queen of the South U20 in the West Development League. Closer to home, he has done West Super matches at Hurlford and Arthurlie as well. He will be assisted by Michael MacDiarmid and Chris McLaughlin.